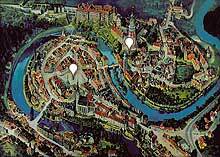 The Jewish population in Cesky Krumlov and his vicinity was steadily expelled. The first records of Jews living in the area goes back to the 14th century, but despite the flourish of Cesky Krumlov�s Jewish community came not until the start of the 20th century. Foundation of the Cesky Krumlov�s Synagogue is associated with the Jewish family Spiro. Spiro family was economically one of the most important families in a region. They successfully run a paper mill in Vetrni and gave jobs to thousands people. The stirps Ignaz Spiro endeavoured to elevate the Jewish community in Krumlov during his life. He put across an erection of a new Jewish cemetery and based a fund for building a synagogue in Cesky Krumlov. The building of the synagogue was not realised until his death in 1894. There was not enough money in the fund, so the project was postponed. In an effort to build a sanctuary continued a Krumlov�s Jewish Community (Israelitische Kultursgemeinde Krumau) with its leader Ludwig Spiro. The synagogue was built in 1908 - 1909 by an architect Victor Kafka. It was constructed in a Nouveau-Romanesque style with signs of Jugendstil. The building features an eight-sided tower and rounded colourful windows decorated with the Star of David, built to face in the direction of Jerusalem. Deep azure painted arch of a high aisle must have been glamorous. There was place for 140 till 180 worshippers in the sanctuary. In front of the synagogue was situated a Sukkoth hut and a beautifully landscaped park. Services took place in Krumlov�s Synagogue until 1938, when the Sudeten German movement and Nazi politics gained control of the town. The Local Nazis plundered the synagogue and the precious furniture burnt. The edifice was miraculously spared from conflagration or destruction. Most of the Cesky Krumlov�s Jews were sent to concentration camps. Just two of them came back home after the war ended. In 1945 it was used as interdenominational Christian church for the American soldiers. 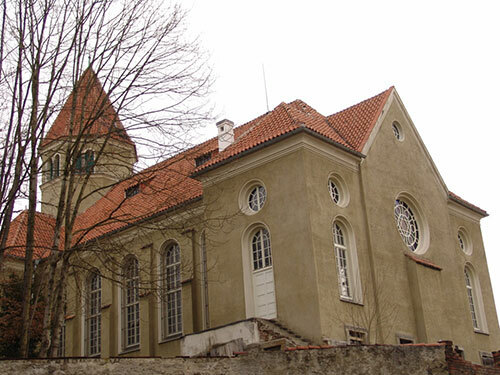 From 1945 - 1968 the Czechoslovakian Hussite Church used the synagogue as their chapel. After 1968 the synagogue became a storage room, eventually housing a repository for unique properties of the Cesky Krumlov�s Baroque Theatre. After the Velvet Revolution in November 1989 the synagogue was not given back to the original owner, the Jewish Community in Cesky Krumlov, because the local Jewish Community was not re-established. The baroque properties were moved away, but the synagogue continued to dilapidate. Not until in 1997 the synagogue was returned its rightful owner, the Jewish Community of Prague, which upkeep of all Jewish sites in the Czech Republic. The reconstruction of the unique religious building could start and bring back life to a quickly cankering house of worship. Before the renovation started, something bad happened. The town hall provided a key from the Synagogue an Israeli woman that promised to invest some of her capital towards repair of the synagogue. But instead of that she opened secret caches, which probably held Torah, jewels or religious artefacts and stole it. The Cesky Krumlov Development Fund rented the Synagogue in the year 2006 to the Jewish Community of Prague for a period of thirty years. This should make the synagogue a functioning place of worship, and an exhibition space (history of Cesky Krumlov�s Jewish Community, and the photographer Alfred Seidl). You will find the Synagoge in the south suburb of historical center called Plesivec in Linecka street.